The RoadPod VL series uses embedded inductive loops to provide long-term traffic data. This modular system is an economical and efficient choice for monitoring one or multiple lanes. 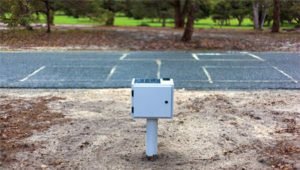 MetroCount offers two versions of the RoadPod VL. The VL5810 model provides vehicle volume, class, speed, direction and other traffic related data. MTE includes standard length classification schemes and offers the option to create others. The VL5805 unit counter is ideal when volume data is sufficient, recording individual vehicles and grouping them in time intervals (eg. 15 min, 30 min, 60 min). Common applications include car parks, national parks and facility entrances. Users can opt for remote access, enabling online data download and site checks. In addition, the MTE software provides diagnostic tools – LoopScope and LoopMonitor – which offer full sensor performance analysis. These tools can also be used to assess existing loops and to facilitate retrofitting the RoadPod VL.